14ymedio, Yoani Sanchez, Washington, 1 February 2015 -- Iranian President Hassan Rouhani cancelled his lunch with François Hollande because the latter didn't want to take the wine off the table. 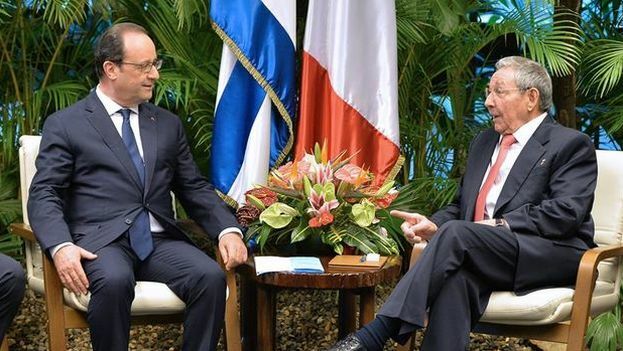 Tonight, however, the French leader will not ask Raul Castro about the issue of human rights violations in Cuba, to avoid annoying his visitor. A gesture that will affect the image of France much more than having dispensed with a glass of red. Facing the leader of a powerful nation with a controversial nuclear program, the authorities did not want to deprive themselves of one of the symbols of their identity. But facing the General who permits no opposition nor independent press in his country, the hosts lower the tone of democratic requirements, similar to Rome's covering the nakedness of his its statues to please Rouhani. In the homeland of "Liberty, Equality, Fraternity," failing to take advantage of Raul Castro's official visit to demand a democratic opening would be a huge disappointment. The reasoning from a French government source, declaring that the question of human rights "is always present," is unconvincing. This is the time to push the octogenarian caudillo for a commitment to a democratic opening on the Island in the near term. France loses nothing if it takes a stronger stance on the lack of freedom under which 11 million Cubans live. Unlike Rouhani, Raul Castro will not purchase more than 100 modern Airbuses, not will he offer a contract for the extraction of thousands of barrels of oil. The Plaza of the Revolution is only going to offer losses and disrepute. It will fall to the French executive to silence the complaints of the creditors of the Paris Club - which last December forgave 8.5 billion dollars in Cuban debt -when they never see one cent of the remaining 2.6 billion that Havana committed to pay over a span of 18 years. Which it is highly unlikely to do, because the Cuban system is an expert in wasting other people's money and in swindling those who help them. The same thing will happen with the 360 million euros of the bilateral accord reached this Monday to finance development projects. Money that Cuban officialdom will use at its convenience, but not to empower citizens to prosper nor to develop an autonomous business network. Over time, these resources end up feeding corruption, the illegal market, and the pockets of the olive-green clad rulers. Raul Castro will promise Hollande tonight that his piece of cake is safe. As he has said to so many, undoubtedly, he will confirm to "friends of Cuba, the Revolution will always remember you." The "friendship" in this case is inextricably linked to complicity in and silent acceptance of the authoritarianism imposed on the Cuban citizenry. It is just another maneuver to gain time. Hollande will leave office and a new administration will have to deal with those who have spent nearly six decades in power in Cuba, and the story will start again at the beginning: commitments, pats on the shoulder, ceremonial photos and a dinner where the wine flows freely, but where the indecent presence of democracy is well hidden.